Today, Henry Markram and colleagues have released one of the first of a raft of substantial new results emerging from the controversial Human Brain Project (HBP). The paper, Reconstruction and Simulation of Neocortical Microcircuitry, appears in the journal Cell. As one of the first concrete outputs emerging from this billion-euro endeavour this had to be a substantial piece of work, and it is. The paper describes a digital reconstruction of ~31,000 neurons (with ~8 million connections and ~37 million synapses) of a tiny part of the somatosensory cortex of the juvenile rat brain. 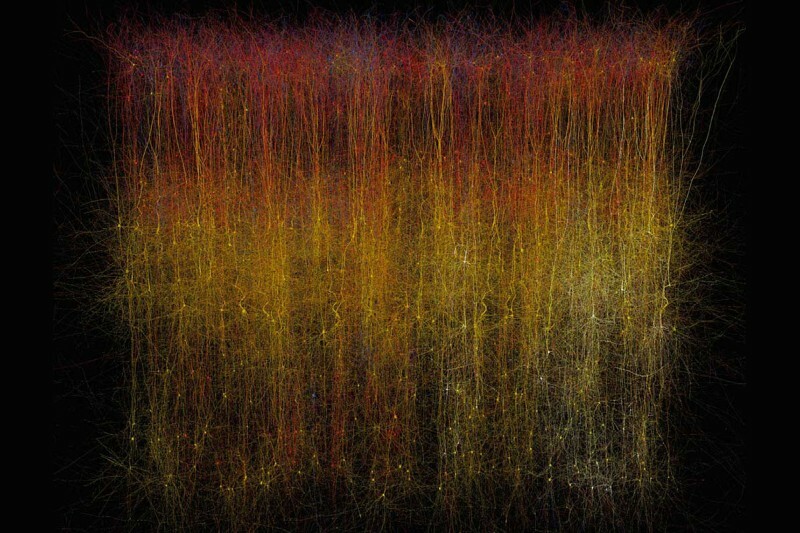 What is unique about this simulation is not the number of neurons (31,000 is pretty modest by today’s standards), but the additional detail included. Simulated neurons are given specific morphological, chemical, and electrical characteristics, and are precisely positioned in 3D space so that they form biologically realistic connections. This level of detail is at the heart of the HBP strategy, and it underlies the claim that the simulation is a ‘reconstruction’ of neural tissue, not just an abstract model of neuronal connectivity. So how good is it? Certainly, the simulation detail is extremely impressive, as is the wealth of experimental data that is accounted for. Particularly striking is the ability to predict both general features of neocortical dynamics – like the existence of ‘soloist’ and ‘chorister’ neurons – as well as to inspire specific new experiments that further validated the simulation. It is also promising that Markram & co managed to interpolate their sparse experimental data in order to fully specify the model, without losing the fidelity of the model to the real ‘target’ system. The authors admit this is a ‘first step’ and the results are certainly intriguing. But the real question is whether the aggressively ‘bottom up’ approach of the HBP will, by itself, yield the transformational understanding of neuroscience that it has promised. Modelling work in science – whether computational or mathematical – is about finding the right level of abstraction to best explore and understand some natural principle, or test some specific hypothesis. A model that relies on incorporating as much detail as possible could lead to a simulation that is almost as hard to understand as the target system. Jorge Luis Borges long ago noted the tragic uselessness of the perfectly detailed map in his short story ‘On Exactitude in Science’. For this reason alone, its hard to be confident that the HBP approach — impressive as it is at the level of a tiny volume of immature cortex — will scale up to deliver real insights about how brains, bodies and environments mesh together in generating complex adaptive behaviour (and perception, and thought, and consciousness). And on the other hand, as detailed as the current simulation is, it still neglects very basic and undoubtedly important aspects of the brain – including glial cells, vasculature, receptors, and the like. This goes to show that even the most detailed simulation models still have to make abstractions. In the present model decisions about what is included and excluded seem to be made more according to practical criteria (what is possible?) than theoretically principled criteria (what are we trying to explain with this model?). Can the HBP be extended both downwards (to encompass the so-far excluded but potentially critical details of neuronal microstructure) and upwards (to a whole brain and organism level, including sensorimotor interactions with bodies and environments)? The jury is still out. So let’s applaud this Herculean effort to simulate a tiny part of a tiny brain, but let’s also keep in mind that the HBP won’t solve neuroscience all by itself, and only time will tell whether it will play a significant role in unravelling the properties of the most complex object in the known universe. The original article is here: Markram et al (2015). Cell 163:1-37. Some of the above comments appear in a New Scientist commentary by Jessica Hamzelou, published 08/10/2015: Digital version of piece of rat brain fires like the real thing. It is important to distinguish here between the Human Brain Project and the Blue Brain Project. The model published in Cell is really the fruit of the BBP, which has existed for about ten years now. While the BBP takes a pure bottom-up approach, the HBP, of which the BBP is an important but far from the only part, is a much broader church, with sub-projects including theoretical neuroscience, cognitive neuroscience and robotics. The simulation and modelling activities within HBP include sub-cellular, molecular modelling, higher-level, simplified, integrate-and-fire-type models, and theoretical/conceptual models. And certainly the core HBP, large as it is, does not expect to solve neuroscience all by itself. A major focus of the project is to build infrastructure, available to the wider neuroscience community, for model-based data integration, analysis and hypothesis testing. Thanks for commenting! You’re quite right to highlight that the present Cell paper has its roots in the BBP, which of course itself provided much inspiration for the HBP. Nonetheless the paper is being seen as one of the first major outputs of the HBP and should, I think, be evaluated accordingly. You’re also right that, on the face of it, the HBP is a broader church than the BBP with important roles for cognitive neuroscience, embodiment and robotics, and higher level theoretical modelling. However one of the persistent criticisms of the HBP since its inception is that these other aspects have been de-emphasized; this indeed was one of the factors leading to managerial changes within the HBP. We’ll have to see what happens next in this regard. I’m not so optimistic but will be happy to be proven wrong. Regarding the provision of infrastructure to the wider community, again this is a laudable effort but there are many concerns. The models are (by design) so complex and so highly parameterized that it is not clear that other researchers will feel confident using them to draw their own conclusions. The HBP simulations are very different in terms of their broader utility from, for instance, building an explicitly experimental facility like the the LHC. However, only with it the system can not approach consciousness. I hope specific resources for consciousness research. IIT and some IIT-inspired hypotheses must have opportunities for assessment.